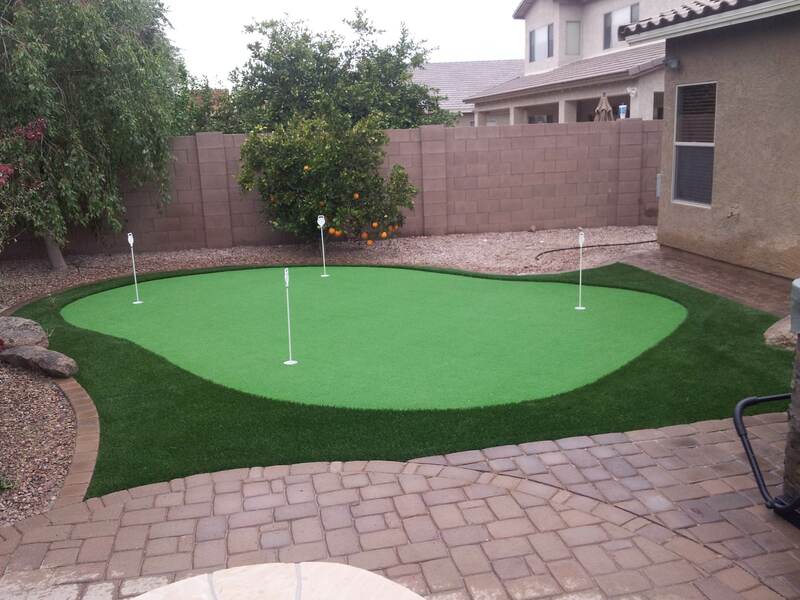 A putting green in your yard can provide a great entertainment feature as well as a challenging practice facility without leaving home in Scottsdale ARIZONA. Tru Putt is our most popular putting green surface with a color of Field Green. The product is made of Polypropylene Slit Film With a face weight of 34 ounces. The pile height is 1"
Like our turf, our putting greens are placed over a layer of cloth weed barrier and approximately 4" of decomposed granite that is heavily compacted. Putting greens can be designed with ungulates and variances in elevation to create a challenging surface with a variety of putt difficulty. The speed of the surface can be adjusted by the amount of infill that is added to the putting green surface. We encourage our customers to be on site during the infill of the surface so you can participate in creating the speed you enjoy. 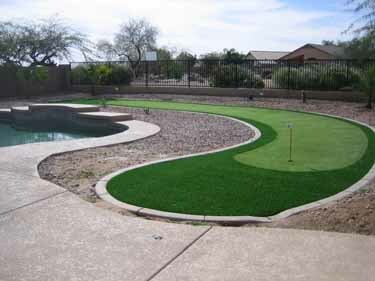 Customers may choose the number of holes in a putting green, and we offer a variety of flag choices. 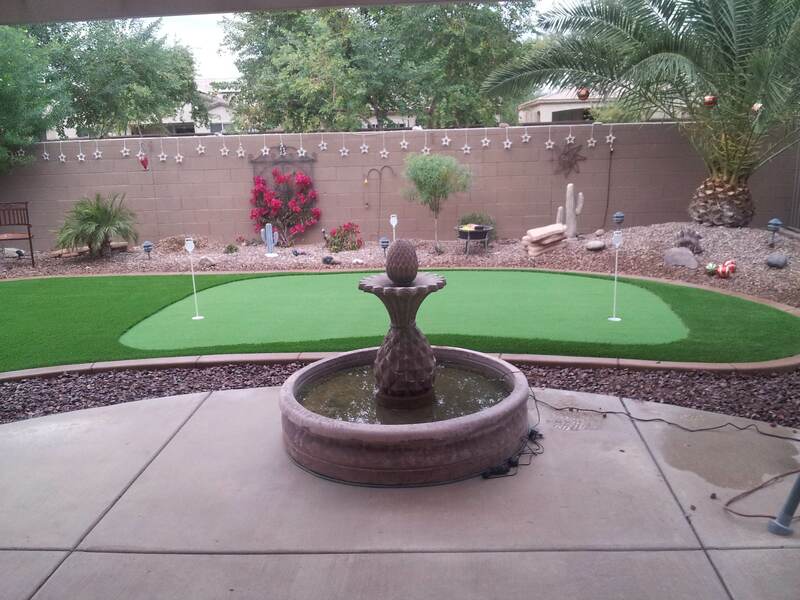 Legacy Green Solutions are experienced consultants in choosing the design and speed of putting greens in ScottsdaleARIZONA. Poly Putt is another choice for putting greens with a color of Light Green and a face weight of 28 ounces. The pile height is 1/2". The infill of Poly Putt is much lighter and creates a surface that is not usually intended for chipping. Ask Carl about the surface that will work best for you. 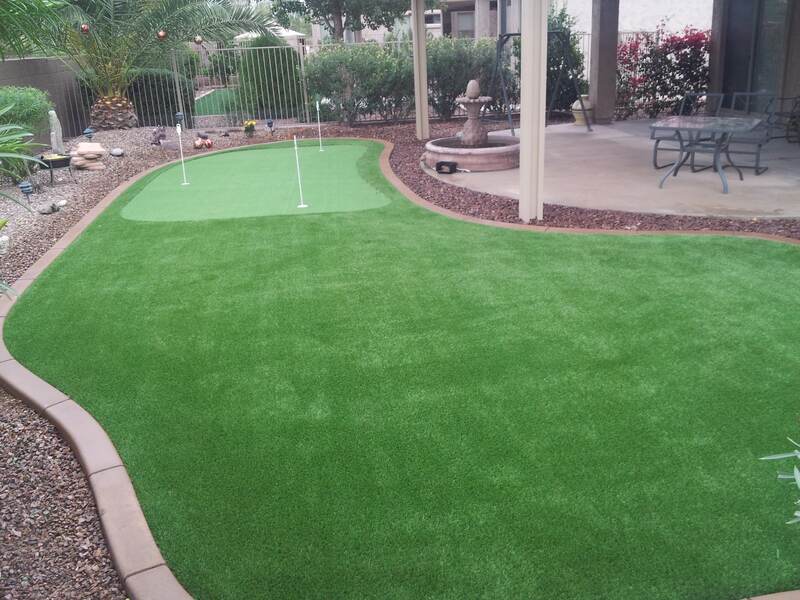 Customers may choose the thickness, color, weight, and design of putting green fringe. We have many samples to choose from.